A beautifully presented and deceptively spacious six bedroom detached family home featuring large gardens backing onto woodland. The accommodation flows over three floors having been extended in recent years by the current owners.Pendower is a delightful detached family home, with five/six bedrooms and spacious, flexible accommodation flowing over three floors, presented to the highest of standards. 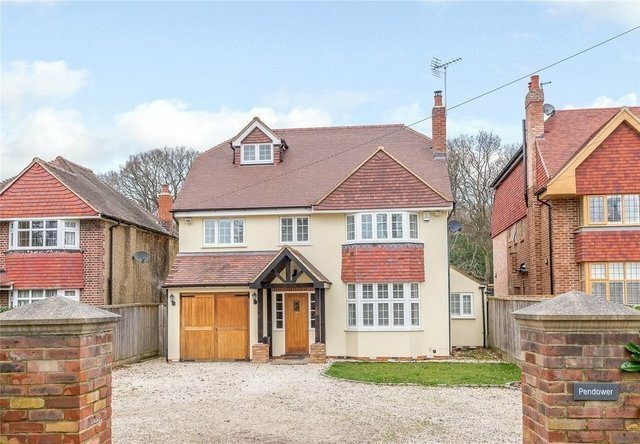 The property is situated in a convenient position in the sought-after village of Farnham Common, with its excellent links to neighbouring towns, the M40 and central London via nearby Gerrards Cross. Having benefitted from various improvements, including an impressive second floor extension, the property provides a wealth of beautifully finished accommodation, with high quality fittings and a light and airy feel throughout.There is a welcoming sitting room, with a bay window to the front and a fireplace with a woodburning stove. To the rear there is a splendid open-plan living space, with a drawing room, featuring French doors opening onto the rear gardens, a breakfast area and an attractive kitchen, with wooden units to base and wall level, an island, granite worktops and a range cooker. The ground floor also includes an office, a study/playroom and a utility room. There are four generous bedrooms on the first floor, including bedroom one, with its two Juliet balconies overlooking the rear gardens and en suite shower room. One further bedroom on the first floor also boasts an en suite shower room, as does the large master bedroom, located on the second floor along with a cosy sitting room/bedroom six. To the front of the property there is a gravel driveway, providing ample parking space for residents and visitors, while to the rear there is a large landscaped garden, with a paved and gravel terrace area leading to a long lawn. The lawn is bordered by shrubs and flowerbeds, and to the end of the garden there is a shed, with a space that could also be used as a children's play area. The gardens are enclosed by hedgerow to one side and timber fencing to the other, with woodland beyond the end of the garden, creating a sense of peace and privacy.